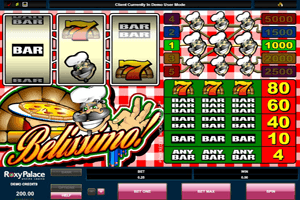 Belissimo is a three reeled slot machine that is one of the classic slots by Microgaming. The game is themed around an Italian Chef who will take you to his kitchen where you can enjoy his amazing cuisine. This exciting theme dominates the slot machine, starting from the background of the reels, the name of the slot to the symbols that will appear on the slot machine’s reels. Under the three reels of the game that players can find on the left side, players will see the Italian Chef holding his favorite meal, a Pizza with the word Belissimo on top. The game has one payline on which players will have to from the winning combos that consists of three similar symbols. These symbols include the Italian Chef in his chef outfit, a red seven in front of an oven and bar symbols. The payouts table of the game can be found at the right side next to the reels. It shows players the different symbols that land on the payline of the game and how much will they get in rewards if they match three of these symbols on the payline of the slot machine. The highest paying symbol is none other than the chef symbol as it can pay players up to 5000 coins when they get 3 chef symbols on the payline after placing the biggest bet of five coins.